Who doesn’t love a bratwurst with their favorite toppings? They are quick, easy and can be fixed to fit different tastes. We also love that you can make them from scratch with a sausage stuffer and smoker or simply pick up a package at your local grocery store. Sometimes, though, deciding which brat is the best for the flavor you want can be tricky. If you are planning on making your own beer brats, use uncooked sausages. Something that has been cured (like a hot dog or pre-cooked sausage) will not benefit from the beer flavor as much as a fresh sausage. Not sure how to tell the difference? Check the labels. The USDA requires labels on all uncooked sausage to have safe handling instructions and cooking direction. Do your bratwursts tend to burst? If grilling over direct heat, the skin will shrink as it cooks. If the inside doesn’t cook at the same rate, your sausage will burst. A common mistake here is to pierce the skin with a knife. Piercing the skin just allows the juices to escape which means a dry or flavorless brat. Instead, use a lower temperature and less time on direct heat. 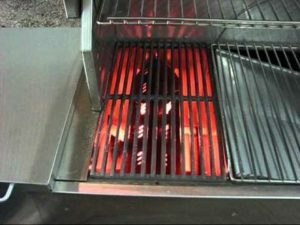 Using a two zone method with both direct and indirect heat is ideal. A short period of time in the indirect zone to allow for the internal meat to cook then you can finish your brats on the direct side to get some of the grilled color and texture. Keep tip one in mind. You can add more smoke to a fresh brat than something that is already cured or cooked. If you prefer less “smoke” flavor, then we recommend grilling. For a more potent “smoke” flavor, get a fresh brat and cook it low and slow over indirect heat for a few hours. If you have any time between pulling brats from the grill and serving, you might want to consider holding or re-heating. We recommend leaving your brats on the warming drawer after cooking. This will eliminate the brats from ever cooling down. 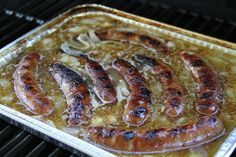 If you need to travel with the brats or set them out buffet style, you can re-heat them by putting them in a small pan (we recommend disposable aluminum foil pans) with a hot water or even hot You want the temperature of the liquid close to your brat temp, at least 140°F. What should the internal temperature of the finished brats be? Don’t just throw your leftover brats in the microwave. Use a hot liquid bath to reheat them instead. 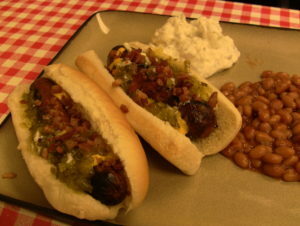 You can also use leftover brats as replacement for hamburger or pork in a variety of different recipes. For a few leftover recipe ideas, check out Johnsonville’s recipe page!